Carrot weevil has increasingly become a significant issue on carrots and celery in some vegetable growing regions of Ontario. Pressure and damage from this pest has been mounting year over year, with older insecticides no longer providing adequate control. 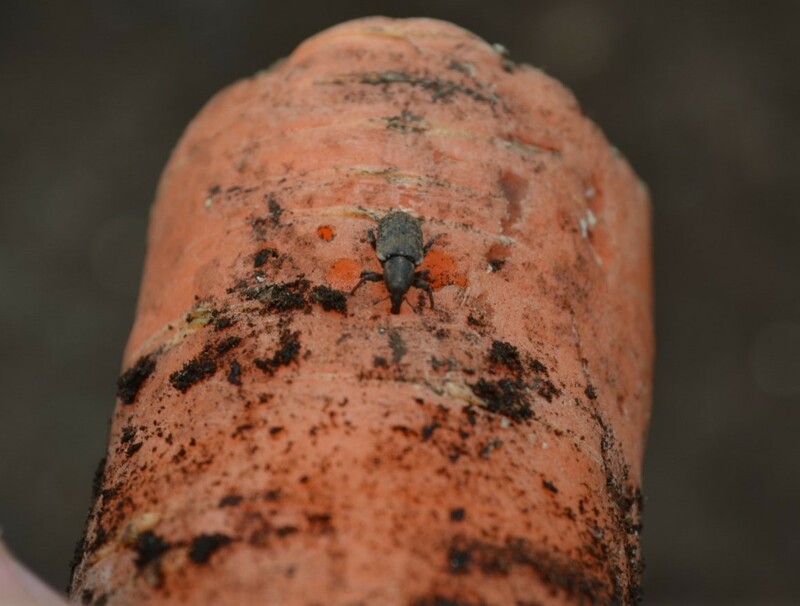 Recent testing by University of Guelph researchers has shown that carrot weevil populations at the Holland Marsh have become resistant to Imidan, the grower standard insecticide used to manage this pest for many years. Screening trials in the last several years have identified two potential insecticides that have efficacy on carrot weevil, Rimon 10 EC and Exirel. Recently they have been registered for carrot weevil on carrots via the Minor Use Program. So, how can growers use these newly registered products most effectively? University of Guelph researchers – Dr. Mary Ruth McDonald and Dr. Cynthia Scott-Dupree, along with graduate student Alexandra Stinson have been working on this issue. Results of the insecticide screening trials in 2016 and 2018 showed that only Rimon and Exirel reduced carrot weevil damage on carrots compared to the control (no treatment). None of the treatments significantly increased yield compared to the control in these trials. In 2018, applications of Exirel were made at the 2nd, 4th and 6th leaf stage of carrots. In terms of carrot weevil damage and yield, none of the treatments were different from the control (no treatment). In 2017, results of the trial indicate that one application of Rimon applied at the 4th or 6th leaf stage reduced damage by 57% compared to the control. Multiple applications of Rimon or Exirel reduced damage by 68-84%. Two applications of Imidan had the same damage and yield as spraying nothing, illustrating the resistance issue. The late single application of Exirel also was no different than spraying nothing indicating that early application is key. In 2018, the trial looked at Rimon sprayed at the 2nd, 4th and 6th leaf stage and combinations of all three timings. There were also Exirel/Rimon rotation treatments with Exirel sprayed at the 4th leaf stage and Exirel sprayed at the 4th and 8th leaf stage. In the early and later assessments, applications of Rimon at the 2nd and 4th leaf stages as well as a rotation of Rimon/Exirel were the only treatments that reduced damage from not spraying anything. Numerically the best treatment was a rotation of Rimon and Exirel starting at the 2nd leaf stage. Overall, early applications around the 2nd and 4th leaf stages seem to provide the best control of carrot weevil. This is good news for growers because this would fit with our current IPM recommendations. We may be able to use these new products similar to how Imidan was recommended previously and based off of trap counts. Rotations of Rimon and Exirel will be important for resistance management. With no potential solutions in the pipeline, growers will need to manage resistance to these two products to preserve their usefulness. Early seedings of carrots are at a much higher risk than later seedings. Typically, carrots planted the first week of June and later have significantly less carrot weevil damage than carrots planted the first 3 weeks of May. Some promising work has also been done on alternative hosts as baits for carrot weevil monitoring. Parsley plants are much more attractive to carrot weevil females than carrots or dill. These results will not only improve our IPM monitoring for the 2nd generation of CW later in the season but may also provide a potential trap crop. If the female weevils could be lured into laying their eggs into a few parsley plants in the headrows, it would be an easy way to reduce the amount of eggs deposited in carrots and would reduce damage. This, along with other carrot weevil research will be continued in 2019.